Sometimes miracles happen in the most ordinary ways. It was January 2012 when our path took an abrupt turn. We were in the midst of fertility treatments but had prayed that if it wasn’t meant to be, the door would close on us. Our miracle began when I decided to purchase a used tablet computer. I responded to an advertisement and arranged to meet the seller, Penny, at her home the following day. When I arrived at her home, I was greeted by a young girl who answered the door. This girl had Down syndrome. As I chatted with Penny she shared with me that she was selling the tablet to help fund the adoption of another baby. I made a comment that perhaps my husband and I would take a similar path because he had told me for years that one of our children would have Down syndrome. She instantly began to tear up and said her husband had known also. There I was, on a simple errand, and I found myself fighting back tears in a stranger’s home. One week later we had an appointment with the fertility doctor. The appointment revealed bad news. But as the doctor talked about more invasive treatment options, I distinctly remember thinking, “The door just closed.” As my husband and I went to lunch we walked past a group of people with disabilities and I ignored the feeling that there was a message in this encounter. As we entered the restaurant and my husband held the door for a young man in a wheelchair, I again had the feeling that there was a message for us. I talked to my husband about it a little during lunch and we agreed to talk more later. That evening we took the kids out for ice cream so we could talk while they played. 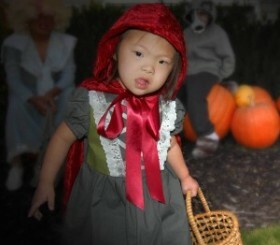 We sat by a little girl who appeared to have Down syndrome. We gave each other that “you must be kidding” look. I think we both knew God was speaking. Over the next few days, I struggled. It was a lot to process. I went through a period of shock as I reconsidered what our future would look like. I kept picturing myself as an elderly woman trying to care for a middle age son with significant needs. I was anxious. I was terrified. And I was extremely annoyed that my husband was neither of those things. I asked him how he could be so calm when we were contemplating something this huge. He said he was calm because he already knew the answer. I confided in my sister-in-law and she reminded me that we weren’t adopting a 40 year old. When our child was 40 years old, we’d have 40 years of experience and we would love him or her completely. I don’t know why, but I needed to hear those words. Within a couple of days I could no longer ignore the promptings and I felt completely at peace, even excited, with the decision. And then I felt like we needed to hurry! So hurry we did. Just six days after our application approval with Dillon International’s Hong Kong Program, we received the referral of our daughter, Naomi. She has been home with us now for nearly eight months and it’s hard to imagine life without her. She brings so much joy to us and to the entire community. We are lucky to have her. Several times a week I look at her and wonder what in the world I was so scared of. She is quick to laugh, loves music, dancing, singing, giving hugs, and getting into more than her share of mischief! Naomi is not a burden. She is a small piece of Heaven. I never imagined as I drove to Penny’s home to buy a tablet computer that it would change our life forever. I am so glad that it did!